Provide comfort for the family of Helen Warholic with a meaningful gesture of sympathy. Helen A Warholic, 99, formerly of Sturges and Jermyn, went to be with the Lord on Thursday December 27, 2018 at the Geisinger CMC Hospice Unit. She was the widow of George A. Warholic who died August 7, 2006, they were married for 66 years. She was the daughter of the late Andrew and Mary Baron Ruziskey. She was born and resided in Sturges most of her life before moving to Jermyn. Recently she was a guest of the Wayne Woodlands Manor. 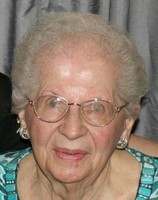 She was a 1938 graduate of Archbald High School, and graduated from Lackawanna Business College. During World War II she was employed at Remington Arms, in Bridgeport Connecticut. She and her husband returned to Sturges for the birth of their daughter Patricia in 1948. Prior to her retirement in 1983 she was a supervisor at Weston Controls in Archbald for 30 years. She was a member of Sacred Heart of Jesus Church, Peckville, and its Altar & Rosary Society. She was a member of the Legion of Mary at St. Mary’s Parish of Eynon and a volunteer at the Lackawanna Health Care Center for over 30 years. She had a deep faith for our Lord and Blessed Virgin Mary. She was also a member of the Mid-Valley Hospital Auxiliary. She had a passion for gardening and cooking, especially her ethnic soups for Christmas and her homemade food baskets for Easter. Patricia would like to extend a special thank you to all the staff at Wayne Woodlands Manor for the exceptional care given to her mom. Surviving are daughter Patricia Warholic, with whom she resided prior to being a guest at Wayne Woodlands Manor daughter-in-law Vienna Warholic, Eynon; grandsons David and wife Paula, Souderton, and Attorney Philip Warholic, Mechanicsburg; great-grandchildren Michael Wood and Danielle Warholic; sisters Alice Pezak Lake Worth, Florida, and Josephine Vailtekunas Bridgeport, CT; several nieces and nephews. She was preceded in death by son Leonard Warholic; sisters Mary & Anna Ruziskey; brother John Ruziskey. The funeral will be conducted on Monday at 10:00 am from the Arthur A. Albini Funeral Home 1003 Church St., Jessup with Mass of Christian Burial at 11:00 am in Sacred Heart of Jesus Parish, 1101 Willow Street Peckville. Interment will follow in SS. Cyril & Methodius Cemetery, Peckville. Friends and family may pay their respects Sunday from 2-4 pm. To send flowers in memory of Helen A. Warholic, please visit our Heartfelt Sympathies Store. Provide comfort for the family of Helen A. Warholic by sending flowers. Our deepest condolences to the family, Mrs Warholic will be missed. From Maryann Visneski (corporal’s wife) and family.